Ready to use, non-alkaline and solvent-free. Safe for all aluminum and carbon parts. When researching raw materials for our bicycle wash, we found out that many popular detergents that cyclists use to wash their bikes are actually harmful to them. Alkaline detergents cause corrosion in aluminum parts over time and take away the shine from anodized aluminum parts. Rex Bicycle Wash has been verified to be completely safe for anodized aluminum parts in long-term soak tests. It also does not leave a film on brake discs and thus weaken their performance. 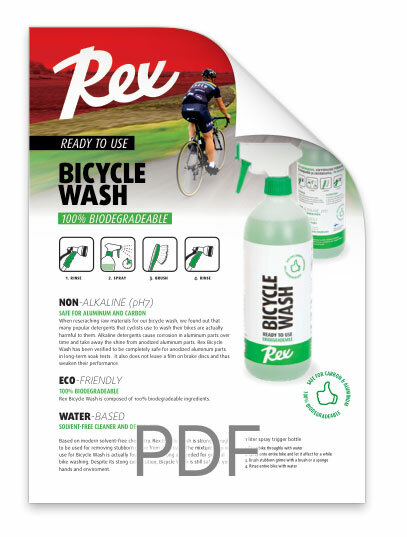 Rex Bicycle Wash contains water, 100% biodegradable anionic surfactants and complex binders. 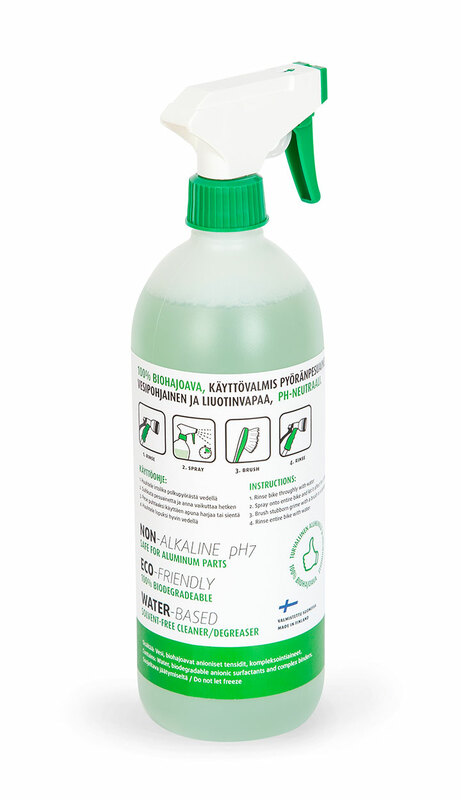 The mildly foaming detergent with a nice lemon grove scent is manufactured at our factory in Hartola, Finland. Rex Bicycle Wash is based on modern solvent-free chemistry. It’s strong enough to be used for removing stubborn grime from drivetrain. The mixture ratio we use for Bicycle Wash is actually four times as strong as needed for general bike washing. Despite its strong composition, Bicycle Wash is still safe for your hands and enviroment.